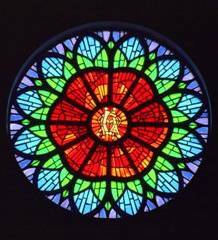 ALPHA AND OMEGA ROSE WINDOW: The beginning and the end. The first and last letters in the Greek alphabet. Used to symbolize the eternal nature of Christ's divinity (Revelation 1:8). This window is back-lighted so it can be seen at night from Seagler Rd and from the Sam Houston Toll Way as a beacon to travelers. The ascension of Jesus into heaven, after which our church is named, is illustrated in this window. Jesus ascended into heaven as the glorified Christ to be with the Heavenly Father. The disciples who stand looking up as Jesus ascends, are now apostles, commissioned to proclaim the Good News of salvation in. the name of Jesus. After the resurrection, Jesus appeared to the disciples on a number of occasions. 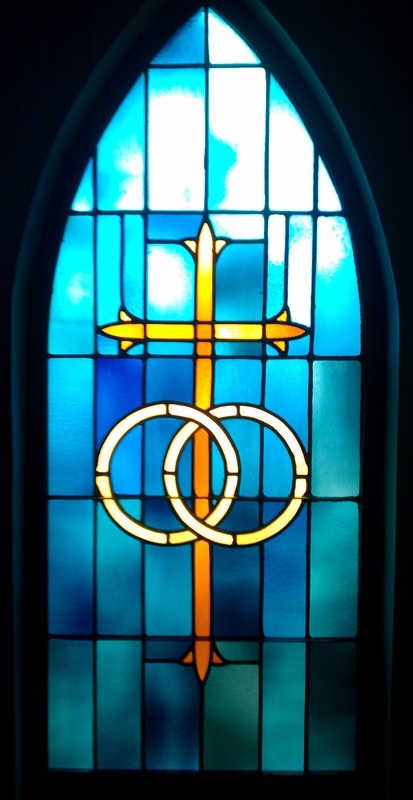 This window recalls the appearance of Jesus to the disciples in the upper room. Jesus spoke the reassuring words, "Peace be with you." There was no doubt in their minds that He was the risen and living Lord. As Jesus was asleep in the boat on the Sea of Galilee, a storm arose endangering the boat because of the waves. The disciples were afraid of dying. Jesus stood to calm the storm, shown here in this scene, by saying, "Peace, be still." Mark tells us that a young man came to Jesus asking what he might do to inherit eternal life. Jesus quoted to him the commandments Moses gave. The young man said he had been trying to keep them. Noticing the young man's obvious wealth, Jesus then asked him to sell his possessions, give to the poor and then come back as His disciple. But the young man rejected Jesus' suggestion, as shown by the gesture he is making. We are told that he "went away sorrowful," wanting what Jesus had to offer but not badly enough to let go of material satisfactions. The chief tax collector in the City of Jericho was small in stature and climbed up into a sycamore tree to get a good look at Jesus as He came through town one day. Jesus noticed him and asked if he might stay at Zacchaeus' house that night. While we do not know what was discussed we know that Zacchaeus completely changed his lifestyle as a result of that meeting. He promised to give half of his income to the poor and restore four times what he had defrauded anyone. Jesus summarized the purpose of His ministry as He remarked to Zacchaeus, "The Son of man came to seek and save the lost." Jesus saw in children the qualities of sincerity, teachable-ness, and simple trust which are so often missing in adults. Children felt drawn to Him and comfortable in His presence. Making of them an illustration, he commented, "Truly, I say to you whoever does not receive the kingdom of God like a child shall not enter it." Then He took them in His arms and blessed them, laying His hands upon them. This miracle story is recorded in all of the Gospels. A young lad contributes five loaves and two fish to Jesus, who in turn multiplies them to become enough to feed the entire multitude. Twelve baskets of leftovers are gathered up afterwards. The story shows that Jesus is concerned for our physical as well as our spiritual needs. It also shows that when we put all we have at God's disposal and offer it for His use, somehow it becomes more than enough to meet the need. The Chi Rho symbol stands for Christ; the bread and fish for the little food that was donated, the basket for the leftovers that remained. A balance scale has always been a symbol of justice and is used here to signify the judgment of God which all of us will one day face. The scepter and crown of a king in the background at the top remind us that God has given the authority to judge to Jesus and that our standing with God ultimately rests upon what we do or do not do with His Son's invitation to believe in Him.